They include such renowned international novelists, playwrights and poets as Alice Walker, Edwidge Danticat, Eve Ensler, Viet Thanh Nguyen, Fady Joudah, Tayari Jones, Dale Peck, Russell Banks, Jorie Graham and Dave Eggers. 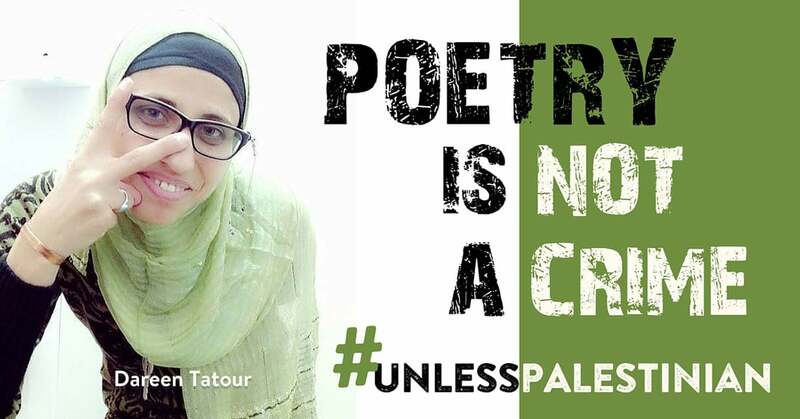 Tatour, who is a citizen of Israel, was arrested in October 2015 from her home near Nazareth and charged with incitement to violence for a poem she wrote and posted to YouTube. She spent several months in three different jails – enduring five separate interrogations – before being confined to house arrest in a rented apartment in a suburb of Tel Aviv. Tatour faces up to five years in prison, according to her lawyer. Her next hearing is scheduled for 18 July. The writers, poets and artists, including nine Pulitzer Prize winners, and 14 recipients of Guggenheim Fellowships, signed a petition demanding that the Israeli government free Tatour. “The Israeli government's actions reveal a desire to silence Tatour, part of a larger pattern of Israeli repression against all Palestinians,” the petition states. “Expressing resistance to oppression and occupation through poetry is by nature nonviolent and should not be criminalized by any government,” it adds. The petition has been organized by Jewish Voice for Peace and Adalah-NY. Tatour is banned from the entire northern district of Israel as well as from using the internet. She is forced to wear an electronic ankle bracelet which monitors her movements. An Israeli court ruled that Tatour cannot travel within 40 kilometers of her hometown of Reineh because, she said, she was considered “dangerous” to the public and to people around her, the Tel Aviv newspaper Haaretz reported. “Doesn't Israel keep broadcasting for all these years what a great democracy it is?” she added. Another high-profile case is that of Palestinian astrophysicist Imad Barghouthi, who is being held by the Israeli military over statements he allegedly made on Facebook. Hundreds of international scientists and academics have called on Israel to release him. “The criminalization of Dareen Tatour's poetry and political expression is, sadly, routine for Palestinian cultural workers, both for citizens of Israel and residents of the Israeli-occupied Palestinian territories,” said Mohammad Hamad of Adalah-NY in a press release. “We could name a dozen more examples. We are encouraged by the response from the literary community to Dareen's case and hope it signifies to all people of good conscience that the time has come to stand on the side of justice for Palestinians,” Hamad stated. Many of the signatories to the petition for Tatour's release are recipients of awards from PEN, the literary organization whose top leadership rejected calls to return funding from the Israeli government for its annual World Voices Festival in April. Nearly 17,000 individuals, including 200 prominent literary figures, publicly urged PEN to drop Israeli sponsorship of the festival. In response to sustained pressure, PEN released a statement last month on Tatour's persecution. However, as Patrick Connors, a member of the campaign group Adalah-NY, points out at Mondoweiss, PEN's statement “denies Tatour's very self-identification as a Palestinian” – the group calls her an “Arab-Israeli” – and fails to mention Israel's military occupation. The statement does not call for her release “though PEN very frequently calls for the release of detained writers,” Connors explains. In a brief statement sent to Jewish Voice for Peace on 11 July and seen by The Electronic Intifada, Tatour explains the effect that her imprisonment has had on her work. “The poem, if it remains on paper, only adds to its writer's worries and fatigue. The worst thing that can happen to an artist in general, and a poet in particular, is to be imprisoned in the democratic era in which we live for expressing their opinion,” Tatour writes. “My freedom, after nine months of harsh detention and exile, is a guarantee to the endurance of freedom for every poet, writer and artist, wherever they are,” she adds. Pressure continues to mount on Israel to give Tatour that freedom.